Abuin, frae left tae richt: Ceety o São Luís an the Laguna Jansen; In the middle: Avenida Colares Moreira; Ablo, frae left tae richt: Entrance tae the Coastal Highway an the Coastal Highway at nicht. 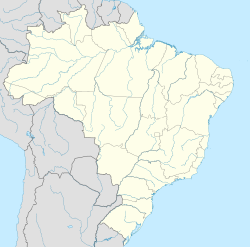 São Luís (Portuguese pronunciation: [sɐ̃w luˈis], Saunt Louis) is the caipital an lairgest ceety o the Brazilian state o Maranhão. The ceety is locatit on Ilha de São Luís (Saunt Louis' Island) in the Baía de São Marcos (Saunt Mark's Bay), an extension o the Atlantic Ocean which forms the estuar o Pindaré, Mearim, Itapecuru an ither rivers.